The Detroit Free Press named software design and development consultancy Atomic Object to its 2017 Top Workplaces list today. Top Workplaces program administrator Energage vets applicant companies using anonymous responses to a workplace culture questionnaire sent to employees across the state. After receiving submissions from more than 240 Michigan companies, Energage and the Free Press ranked Atomic Object among the top five highest-rated small workplaces—those companies with fewer than 149 local employees—in the state. Atomic Object CEO and Co-founder Carl Erickson says the company’s award-winning culture emanates from the “Atoms” who work there. “It’s about being careful in hiring to look for the non-technical traits we care about: values alignment, curiosity, caring, life experience,” he said. Atomic Object has grown to more than 60 people and two offices over the past 16 years. Erickson says that although the company’s core values haven’t changed over that time, the diversity of its workforce has. “It’s powerful to have people from different backgrounds, different professions, different generations aligned around some common values,” he said. In their survey responses, Atoms commented on the company’s variety of interesting project work; flat leadership structure; 40-hour workweek; open-books management; strong social bonds; employee ownership structure; quarterly profit sharing; sponsored lunches between coworkers; and commuter benefits. 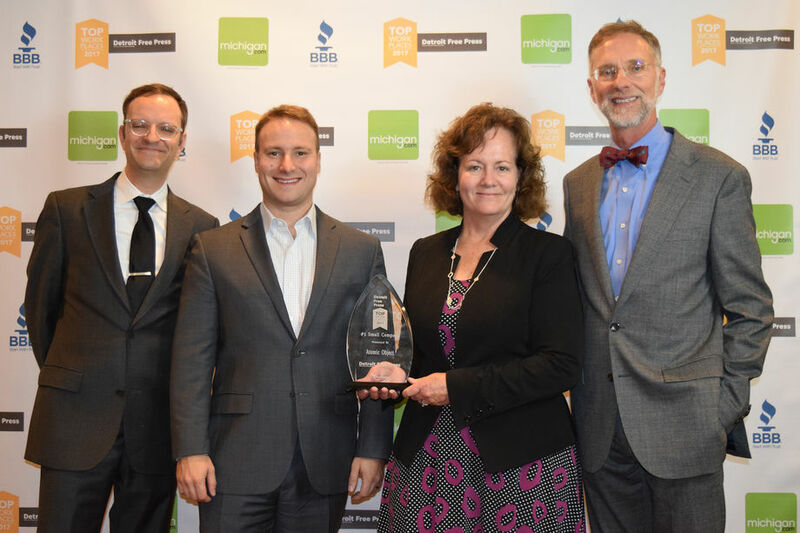 Erickson, joined by Atomic Object Business Manager Mary O’Neill and Managing Partners Jonah Bailey and John Fisher, attended the 10th Annual Top Workplace Awards Event in Troy Thursday night to celebrate the distinction.